The original call for papers for this event generated such interest that there are now two linked events taking place under the banner of Perversions of Paper. The first is an invitational workshop on Friday 20 June 2014 and approaches the themes specifically from the perspective of contemporary arts and creative practice. It brings together invited participants from a range of different practices, (art, poetry, performance, printmaking, papermaking), each of whom focus in different ways on the use, reuse and misuse of the page in a creative context. 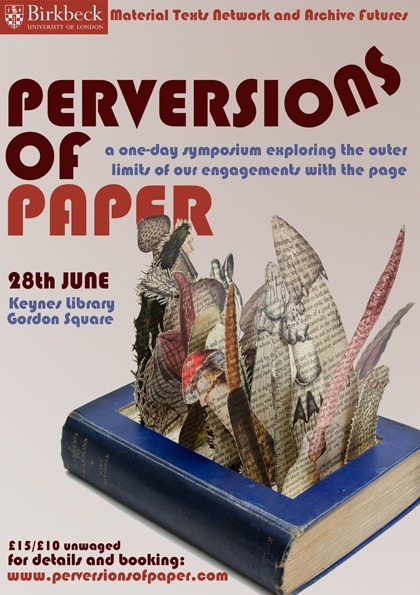 The second event is a syposium on Saturday 28 June 2014 offering an exciting series of papers investigating the outer limits of our interactions with books and manuscripts and with paper. Both events take place in the Keynes Library at Birkbeck College and more details can be found here. Perversions of Paper is jointly sponsored by the Birkbeck Material Texts Network and Archive Futures.